Dad will love one of these this Father’s Day! Guzmanias are stunning table-top plants with long, narrow, shiny green leaves that rise from a deep central cup. 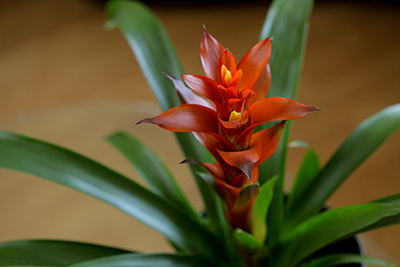 The plants are somewhat taller than many bromeliads, and their large and showy flower bracts emerge in spring. Guzmanias are not difficult to grow, and will reward you with many weeks of colour with little or no effort. ● Guzmanias require low light and should be kept out of direct sunlight. ● Place water in the central cup of the plant and replace frequently to keep it from rotting. Keep the potting mix moist during spring and summer. ● Guzmanias thrive in temperatures of 13°C or higher. ● Because they are tropical plants, guzmanias benefit from high humidity. 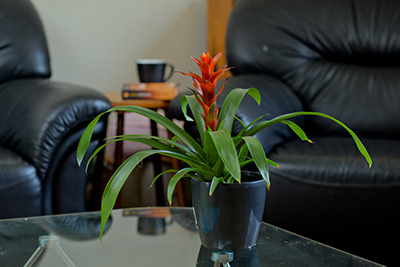 A light daily misting will keep your guzmania looking its best. to induce them to flower by treating the plant with ethylene gas. you will know if the treatment was successful. ● Many bromeliads are classified as ‘epiphytes’ or air plants as they grow on other plants and in other elevated positions. They are not parasites but obtain water and nutrients through a spongy covering of their roots. ● Recent findings have shown that this is one of many foliage and flowering plant species that can clean air of pollutants.